Jane is passionate about helping other authors learn the craft of creative writing. She teaches in-person at various events and in 2007 released Wannabe a Writer book followed, in 2010 by Wannabe a Writer We’ve Heard Of. Click here for more details. 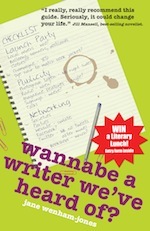 There is also a chat room (on https://kiwiirc.com/client/irc.afternet.org/?nick=#wannabe) where writers meet every Sunday morning (c. 10.30am UK time). We look forward to meeting you there! The theme continues in http://wannabeawriter.com, a website run by Jane and Morgen Bailey to provide a variety of writing-related information. Should I get an agent or a publisher?